After several delays, Max Payne has finally made its way to Google Play. Rockstar did a pretty good job with device support, and we got an early look at the enhanced Tegra 3 version. If you're a fan of this sort of action shooter, you're in for a treat. If you're not into the cinematic action genre, you'll still appreciate how the game looks and the excellent graphics Rockstar came up with on this one. After you get it installed, that is. 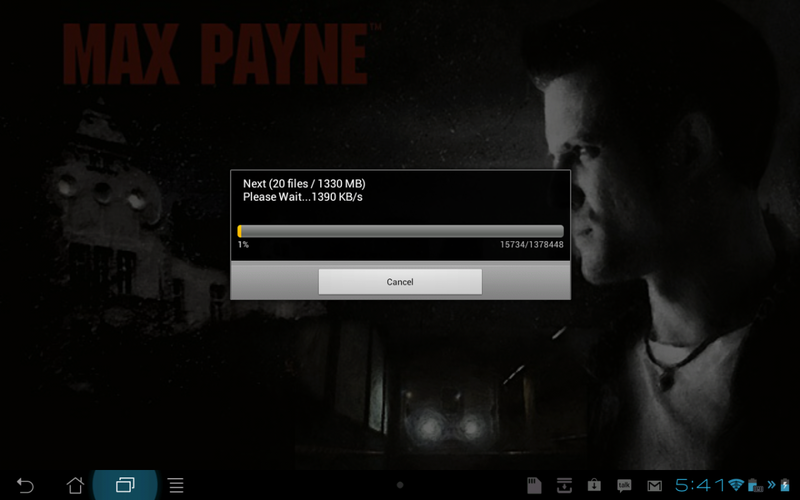 We can't go any further without mentioning that Max Payne requires a whopping 1.4GB download of game files. The servers were pretty speedy (with nobody using them, anyway) but that's still about half a data cap worth of downloading. Make sure you're somewhere with Wifi when you install this one. I don't want to sound like I'm knocking them for doing it, the game certainly looks great and those resources need to be downloaded. Consider yourself warned. As a cinematic action-shooter, there's quite a bit of story behind the game. 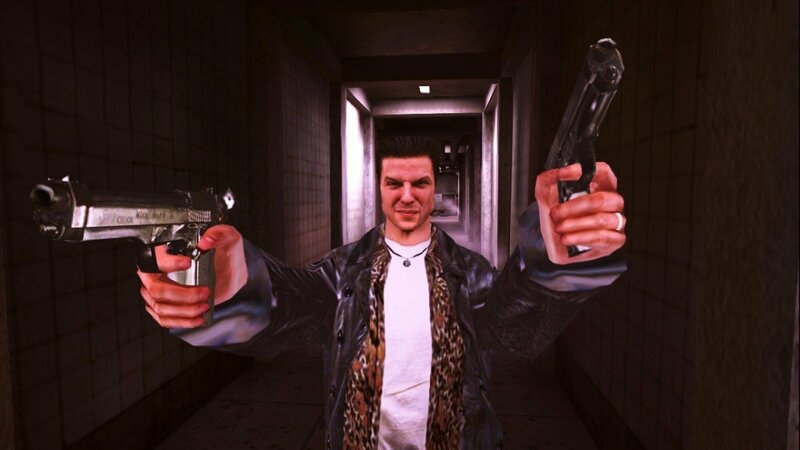 Without too many spoilers, Max Payne is a DEA agent with the task of taking out a group of designer drug peddlers. You'll have plenty of time to follow the story, as Max Payne is a mix of gameplay, cut-scenes, and cinematics. The story-board style cut-scenes will remind you of a graphic novel or comic, and are done with just a touch of 1950's style gangster-noir -- which fits Max Payne really well. As expected, the gameplay on the Tegra 3 is superb. The additional textures and filtering, as well as all the lighting and physics enhancements really show off NVIDIA's gaming heritage. Controls are a bit complicated, especially on a smaller screen, but the game played great on both the Transformer Prime and the international HTC One X. Two things help with those complicated controls, though. There's a pretty thorough tutorial that helps you understand the movements and actions your toon can do, as well as demo how to interact with the world around you. The second thing is the excellent game controller support. I used a Logitech F710 wireless controller, which worked flawlessly with zero setup. This controller is known to work well with Android anyway, but not having to change any settings or map any buttons was a really nice touch. In the end, if you have the means to use a controller with this one you'll be glad you did. There's other options and settings, where you can change video properties and sound settings, as well as aming settings to adjust the sensitivity and speed of that little dot on the screen (use them). full integration with Rockstar Social Club -- Rockstar's online gaming community -- is also part of the package, and users can earn achievements and unlock cheat codes. Pretty cool if you're into that sort of thing. The gameplay itself is smooth and fluid, seems to be at a really high framerate, and rivals what you'll find on a console with the Tegra 3 version. You progress through the game, killing bad guys and finding you way to the next level by checking out everything round you. There's some clipping and bodies can find their way into some pretty unnatural positions, but for the most part it's a realistic representation with excellent game physics. I just wish there was more of it. Max Payne was designed strictly for fans of cinematic action games, and if you don't enjoy plenty of cuts and video, you'll get a bit agitated. I found myself instantly fast-forwarding any time I could, as I just wanted to kill things. That's not a fault of the game, though -- it's just not my style. If it's your style, you'll love his one. 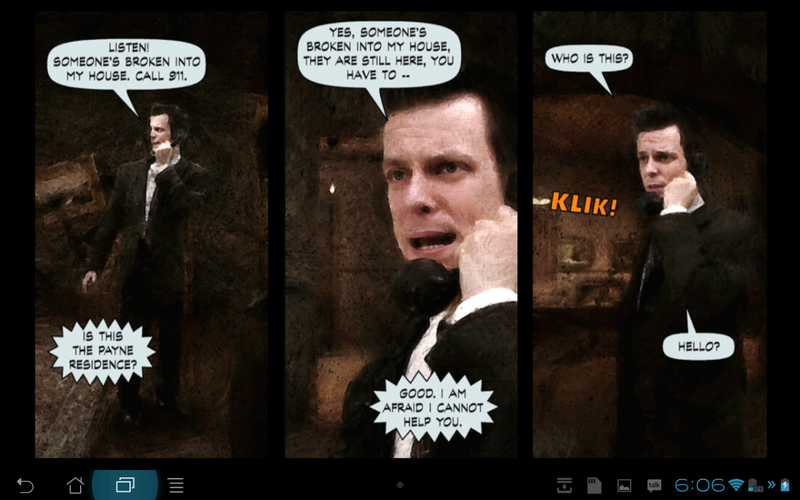 Max Payne will be found at the Google Play store shorty, and will set you back $3. Hit the break for a spoiler video of the first act and some screenshots.